I enjoy seeing the woods return to spring. It's an impressionist painting unfolding. After winter in Michigan, anything, even "liquid sunshine", is welcome as we get above freezing. Woodland flowers are popping up, but the songbirds started even before any botanical renewal. Today's title gives away the sound of yet another bird whose "song" is definitely percussion instead of melody. It's also an exercise in how a poem or ballad can be made into a story. 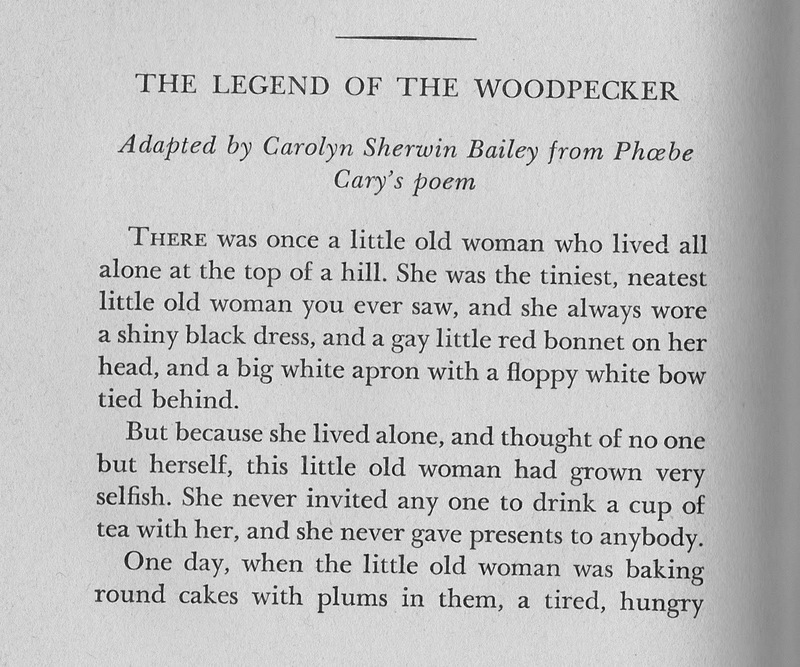 Carolyn Sherwin Bailey has been mentioned here in earlier posts and she always knows how to craft a story for her audience, especially children, who are NOT the easy audience some adults assume. 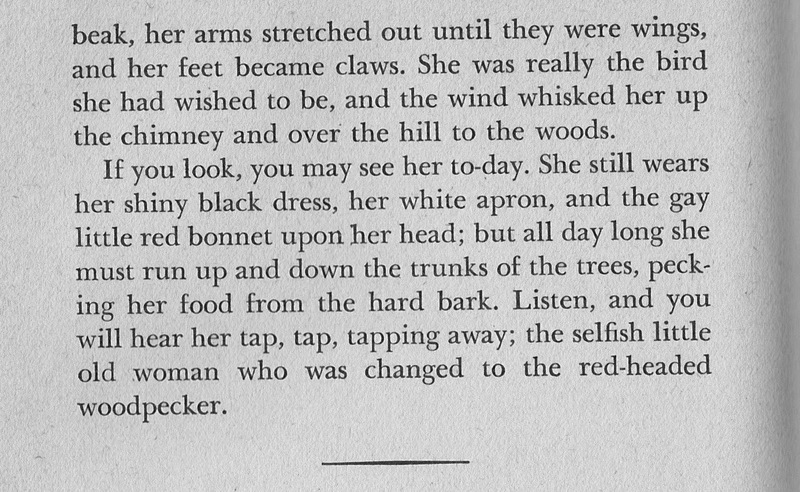 Today she took a poem, which kept its suspense, by just calling it "A Legend of the Northland." Still I suppose Ms. Bailey preferred clarifying the story for her readers. In telling the story I would prefer waiting until it was revealed at the end. Notice the poem looks to many stories where St. Peter and other saints visit ordinary people revealing virtues or vices to form the story. 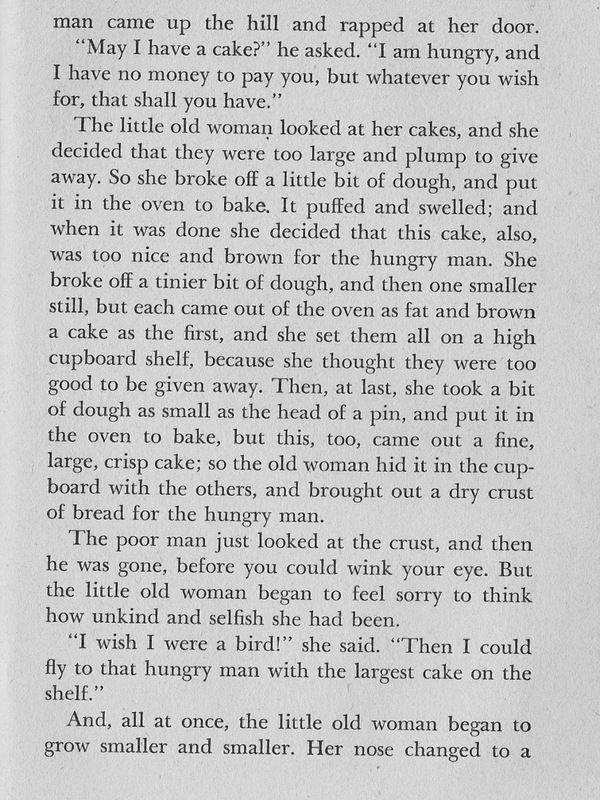 Folktales, however, also often just use an elderly man or woman who may have mysterious powers. 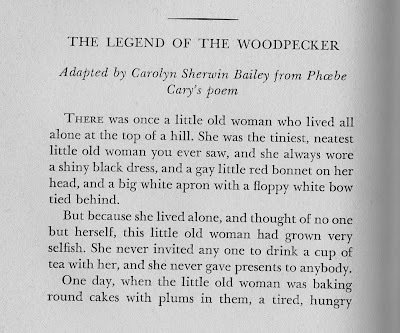 Here's the story and then I'll give the poem which inspired the story and a bit more about the poet, Phoebe Cary. 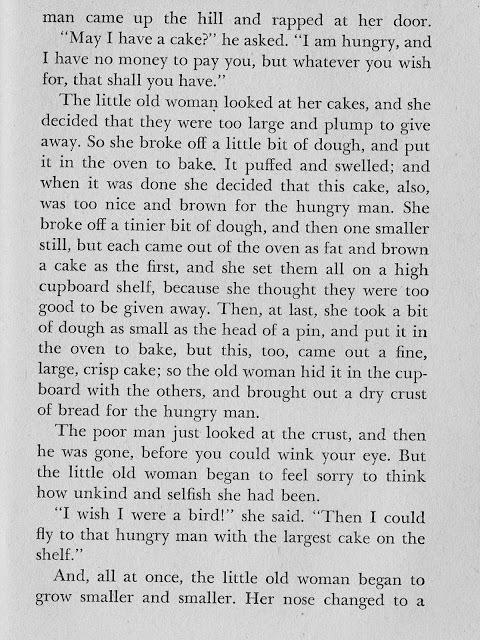 That's from http://catalog.hathitrust.org/Record/100106024 Ballads for little folk, by Alice and Phoebe Cary; edited by Mary Clemmer Ames. Comparing the Wikipedia article about Alice Cary, with the earlier mentioned one for Phoebe, frankly I think I would have found Phoebe far more interesting. As for her best known poetry, go to PoemHunter, but I'd also recommend a look at those Ballads for Little Folk. 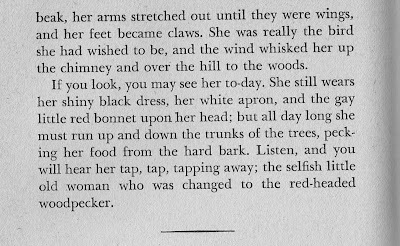 One other quick note occurs to me while in the woods where the woodpecker is tapping out bugs. 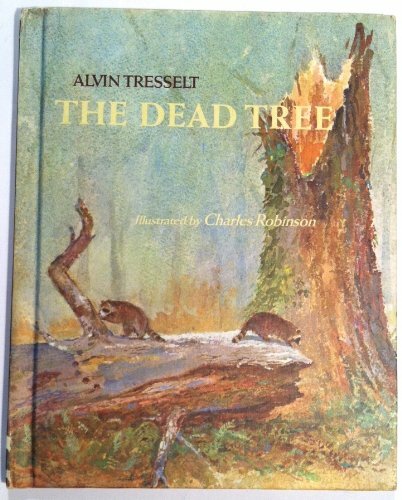 I recommend a children's book, The Dead Tree by Alvin Tresselt, which shows the whole life cycle of an oak even when it might seem at first glance to have become useless.